Blueberries are one of North America's native fruits. Blueberries rank in the U.S. diet as having one of the highest antioxidant capacities among all fruits, vegetables, spices and seasonings. Antioxidants are essential to optimizing health by helping to combat the free radicals that can damage cellular structures as well as DNA. Preheat oven to 400 degrees F. In a medium bowl, blend butter, sugar, vanilla extract, egg, and milk. In a larger bowl, sift flour, baking powder, and salt. Pour contents of medium bowl into large bowl and blend together. 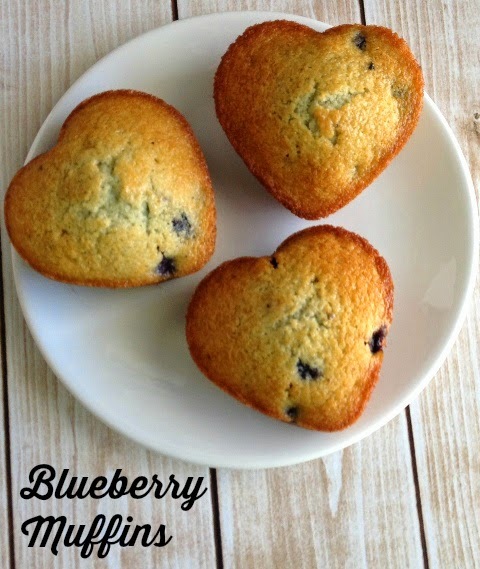 Fold in blueberries, spoon into muffin cups, about 2/3 full. Bake 20 minutes at 400 degrees F. Enjoy warm or at room temperature! Get a heart-shaped pan HERE. These are made with that cast iron heart pan? Wow! They look delicious! They are made with a very similar pan, but I couldn't find the exact pan online. I bought my pan many years ago.